Sharp is the world leader in LCD flat panel production. Samsung is closing in on the volume category as well, but I believe Sharp's strategy for LCD TV production has superior technology at heart. I have seen incredible advancements in some of Sharp's technology over the past year—specifically in widened viewing angles, increased black levels, and faster response times. The Sharp LC-26D7U LCD TV certainly showed all of the advancements I was anticipating. This model replaces the LC-26GD6U in March 2005 as the 4th generation model in the 26" size category. Sharp's LC-26D7U embodies the excellent picture quality and refined design standards delivered in its flagship AQUOS line. This 26-inch LCD display's refined image reproduction and comprehensive array of well-implemented features make it a versatile display for use in a bedroom, breakfast room or small living room. In addition to excellent picture quality, this display looked incredible in our test viewing room: the display is trimmed with a black strip that is in turn cleanly framed by a smoke-silver (titanium) strip above, housing basic operation controls, and a smoke-silver strip below, with the Sharp logo and speakers. The picture quality on the Sharp LC-26D7U LCD TV was astounding. While watching a documentary broadcast—fed into the display at 1080i from our HDTV tuner, I was blown away by the accuracy with which this LCD TV reproduced different types of images. Close-ups of faces during interviews revealed every nuance in the complexion of people's faces. Thanks to the HD display's 1366 x 768 resolution, individual hairs in subjects' heads were clearly visible. When the documentary switched to the streetscape of a Mexican city's colonial quarter, I could see the individual contours of each stone in a cobbled street. Vibrant colors poured out of vegetable street stalls and the woven textures of street vendor's clothes were clearly reproduced through vibrant Aztec designs. The display's powerful backlight, a staple of Sharp's AQUOS line, allowed the bright mid-afternoon sun on the Mexican street scene to pour out of the display, seemingly warming the viewing room, but never hampering the display's ability to reproduce a color accurate image. Non-HD broadcast material, which varied greatly in quality, displayed well and maintained a rich display of color. While testing the Sharp LCD TV with DVDs, we were equally pleased with picture performance. 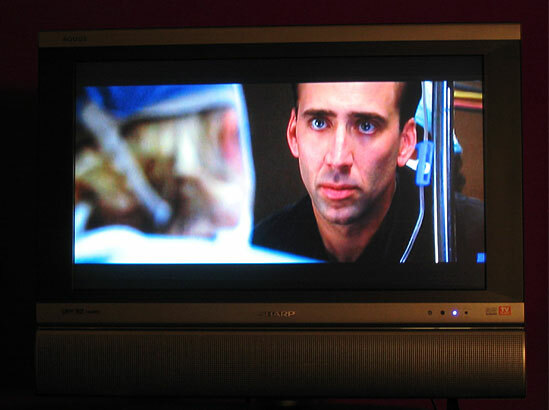 In the ominous hospital scenes at the beginning of City of Angels Nicholas Cage and Meg Ryan met in dark, yet detailed, hallways thanks to the display's 800:1 contrast ratio. I was generally pleased with the display's initial factory settings. Turning down the contrast slightly improved the picture, but beyond that tinkering with brightness, color, tint and sharpness controls yielded little picture improvement. While watching City of Angels and later test movies, I found using the advanced picture control menu to adjust the hue, saturation, and brightness values allowed me to tweak movies further to my liking. Cranking the yellow channel while watching City of Angels cleared a slight dark overcast from the picture and let skin tones, and Meg Ryan's blond hair, shine through. 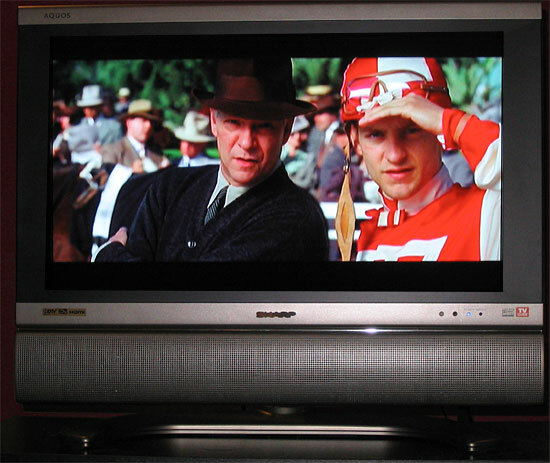 Similarly, using the individual color adjustments to tweak the green channel in Seabiscuit made for more realistic outdoor racetrack scenes. Fast-action scenes exhibited little motion lag artifacts typically related to LCD response times. One adjustment owners definitely will want to make is to turn down the backlight adjustment from its factory default maximum (+8) to prolong the bulb's life (unless you are in an extremely bright sunlit room). I recommend turning the backlight setting down to 0 for normal viewing conditions. Sharp rates the bulb's life at 60,000 hours. A thoughtful feature of this display is an OPC feature that, when enabled, automatically adjusts the backlight according to the ambient light in the room. This feature is ideal for use in a bedroom or living room where a user might want take advantage of the built-in sleep timer to doze off to a movie, with the backlight turned down, and wake up to the morning news with the LC-26D7U LCD TV's florescent bulb working full-throttle, shining through a sun-filled room. I experimented with the OPC setting by turning on and off recessed lighting in the viewing room and watching the display automatically adjust between intermediate backlight settings. For a more robust, if-not ridiculous, test of the OPC feature, I darkened the room and then turned a halogen light, aimed straight at the LCD television, on and off and watched the unit bounce between its lowest and highest backlight settings. While the auto-backlight adjust feature worked impressively during this test, what struck me as astounding was that even with a halogen light pointed directly at the LCD, there was minimal glare thanks to the display's excellent anti-glare technology. Furthermore, this display achieved an impressive 170 degree viewing angle with very little loss in brightness or contrast at the most extreme angles. I recommend a viewing distance of 5 to 10 feet from this 26-Inch LCD TV. The LCD television display includes 4 aspect ratio options for scaling and zooming video content, which Sharp places under the "view mode" menu. They include sidebar, stretch, smart-stretch, and zoom. For 4:3 sources smart-stretch works best. The scaling conversion was excellent and we found little distortion in the picture using any of the modes. The LC-26D7U LCD has excellent sound reproduction, well-designed menus, a bevy of inputs, multiple installation options, and an on-screen TV-guide system that can control recording to a VCR or DVD-R device. Its only shortcomings are a frustratingly small menu display font and not having a forward-backward tilt installation option without opting for the tilt wall mount accessory. Using this LCD television is generally a pleasure. With the 10-inch long, full-function remote control in your hand you feel like a king with a scepter or fairy godmother with a magic wand—the display in front of you is either at your mercy or the whim of your imagination, depending on how you look at it. There are easy access buttons for all of the most important settings and options: view mode (Sharp's term for aspect ratio control), a picture location adjustment, and Dolby Virtual on/off are among the handy feature that are assigned their own buttons. A few rarely used controls such a picture-freeze and closed-caption control, are underneath a door at the base of the remote. Unfortunately the useful AV-MODE button, which allows the user to switch between different video configuration profiles, skipping the video adjustment menu, is hidden under the remote door as well. Navigating though on-screen menus is generally straightforward. Sharp uses the same drop down menu system it uses in its cheaper, non-AQUOS line of LCD TVs, but the AQUOS menus feature a cleaner, easier to read screen font, and shadowed overlay on top of the screen. Unfortunately, for a display that can be comfortably viewed at 10 feet, reading the menus becomes a challenge for those without perfect vision (or at least perfect corrected vision) much beyond 7 feet. Otherwise controlling the display is a pleasure. Two powerful 10-watt speakers housed below the screen deliver full, rich sound. Given that the built-in sound of some displays is a major shortcoming, and that a screen this size is likely to be used in a smaller room without a surround system, excellent sound is a key advantage of this unit. I found that raising the treble to between +5 and +8 on its -15 to +15 scale made narration slightly crisper. I also found that for some movies, enabling the Dolby Virtual did a commendable job at creating the illusion of depth. Toggling between Dolby Virtual and stereo to determine your preferred mode is a painless task thanks to a shortcut button on the remote. Despite the lack of physical distance between the bottom-mounted speakers, stereo separation was clearly audible 10 feet in front of the TV in either Dolby Virtual or stereo modes. 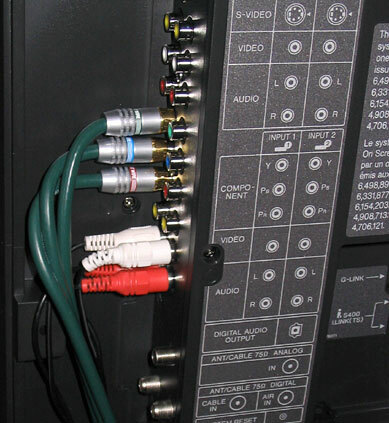 For those wanting to connect the television to an external amplifier, there are both RCA stereo monitor outputs and an optical digital audio out connector. The monitor output can be configured to output a fixed-volume signal or adjust with the TV's volume control. Sharp says the TV's speakers are removable, though how to remove them wasn't obvious and was not detailed in the manual. For those who want to use the display solely with external amplifications, disconnecting input leads on the back of the display will disable the internal speakers. Those users needing to connect this LCD TV to multiple sources have plenty of input options: , three composite inputs, one DVI, one HDMI, two component video using RCA jacks, one s-video, and a host of accompanying audio inputs.. The three composite coaxial input jacks include a cable/antenna analog jack, a digital cable jack, and a digital antennae jack. For purely digital connections, users have can choose from HDMI, the single-cable digital video/audio gaining traction for interconnecting digital components; 24-pin DVI, the display's only computer connector; or i.Link. The DVI input, which can be used with VGA-only computer with an after-market adapter cable, is paired with a 3.5 mm stereo mini-jack audio jack to make connecting to a computer's audio output easier. The display also includes two i.LINK (also known as FireWire or IEEE1394) connectors for connecting i.LINK equipped hard disk recorders or Blue-ray disc recorders. Sharp's manual says FireWire or i.Link equipped DVD-recorders, digital video cameras, and computers cannot be used with the TV—too bad given the popularity of iLink camcorders with consumers. Switching between inputs is easy using the input menu, which automatically detects which jacks have devices connected and adjust its options accordingly. New to this generation of AQUOS is a built-in TV guide system. When you first plug in the TV you are asked for a zip-code during the initial configuration, since the programming information is location dependent. The system collects information from broadcasters while the unit is turned off and displays programming information on-screen in an interactive format similar to those used by satellite and cable providers for some years now. In order to use the system though, you'll need to connect your TV either directly to a cable feed or antenna (the display has a built-in CableCARD slot to make this easier) or connect the LCD television to a satellite or cable box via a composite RCA connector since the TV-guide system can't collect programming information over component video. Users can program the TV guide system to automatically record a program on their VCR, using an included G-Link cable that controls the VCR and, if attached, a cable or satellite box, via infrared. Minimal space is needed to install the LC-26D7U. With the included swivel table stand attached the unit is 22 1/4 inches tall, 10.5 inches deep, and just over 26 3/4 inches wide. Thanks to the approximately 4-inch tall strip of bottom-mounted speakers, the unit retains a sleek, narrow profile. Without the stand the profile shrinks to 20 1/4 x 4 1/4 x 26 3/4. With the included table-display the screen is easily adjustable from side to side thanks to a solid handle on the back of the display, but it can't be adjusted for forward or backward tilt. A wall mount ($120USD street), tilting wall mount ($135USD street), and articulating wall mount are all available as options. For recessed installations users will want to consider that the majority of generated heat vents through the top.. Furthermore, cable connections are recessed into the unit under a removable plastic cover. Thoughtful though the cover is, those people using high-quality cables, will find it a bear to reattach securely with all cables concealed inside. With a street price upwards of $2,300, the LC-26D7U is pricey. Consumers needing fewer features, and not worried about future expandability, might want to look elsewhere. Those willing to pay a premium for the best latest offering in high-end AQUOS line will get near flawless picture and sound quality, a full-set of features, and plenty of future expansion options.